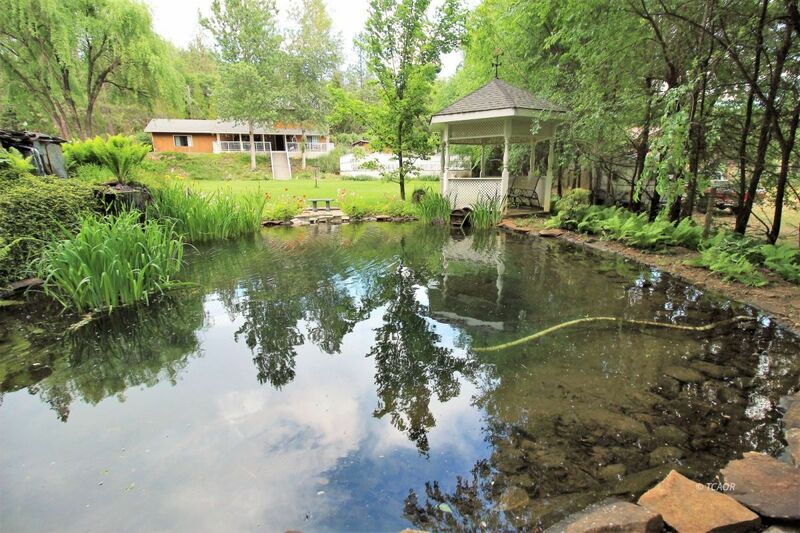 Live on the creek with pond, waterfall and lush green lawn. This property is set up for enjoying the outdoors yet has plenty of room inside for lots of entertaining. Paved driveway leads to home and grounds, detached one car with workshop or storage area, trek decking both in the front of the home and around the above ground pool (16 x 32'), RV hook ups, horseshoe pit, disc golf, large fenced (black chain-link) set up for gardening and a chicken coup with storage for feed, green house for garden, lovely pond with waterfall feature all beautifully landscaped. 4 bedrooms, 2 full baths, 2 half baths, formal living room with propane fireplace, large kitchen, double oven, built in microwave, dishwasher, dinning area leads to a large family room. Laundry across the hall from the kitchen which leads to outdoor fruit tree area and dog run, door in laundry leads to a 2nd floor exercise room (that could easily be a bedroom, and office area. Down the hall from the kitchen laundry room is the downstairs master bed and bath and in that hall is a guest 1/2 bath, around the corner is a stairway to 2 large bedrooms with a full bath in between the bdrms, also large linen closet. Must see!